Review posted May 3, 2018. G. P. Putnam’s Sons, 2016. 416 pages. 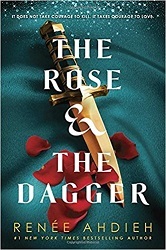 The Rose and the Dagger is the conclusion to the story begun in The Wrath and the Dawn. I enjoyed this volume even better than the first. It was a little less confusing, a little easier to believe and understand who was in love with whom. Anyway, in this volume, Shahrzad and her caliph Khalid are separated after the storm that blew apart his city. But Shahrzad is learning that she has magic of her own. She needs to learn to use it. And that starts with a flying carpet. This book involves Shahrzad learning magic and trying to break Khalid's curse. But his kingdom is also in danger, and there are shifting loyalties and treacheries around them to navigate. Can they break the curse and simply live together in a peaceful kingdom? Or is that too big a dream? This yarn will keep you absorbed with its twists and turns. A tale of love and magic and treachery and loyalty in the desert.